And it’s done! 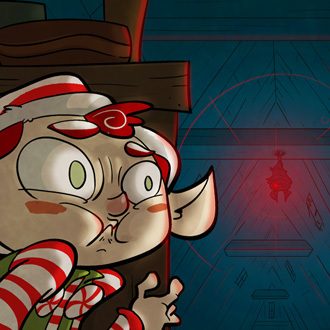 It only took two years but the story of the Peppermint Elf is now complete and we can move on to new things (well, there’s an epilogue, but it’ll be short and sweet.) Hopefully, this tale will get the word out that there will be retribution to those that would sneak around baking confections during Christmastime!!! Unfortunately for the elf, this public service was enforced by the Bat, and his punishments are cruel. Welcome to 2017, JEFbot readers! Happy to be here celebrating a new year with you on this site, once again. Things (i.e. life, work) are starting to get busy again so I can’t promise updates on any sort of regular schedule, but I’m excited at the prospect of getting back to the little adventure jefbot and Mu are on. Hated to leave them in such a dire predicament. happy to hear it, Balorth! my creative juices are getting all worked up over getting back to the main comic. great minds, Shanna – this very thing will be addressed in the epilogue! heheh. Oh dear, I fear what the next Christmas Bat storyline will be like… Seems like it gets more and more horrific for every roman numeral! 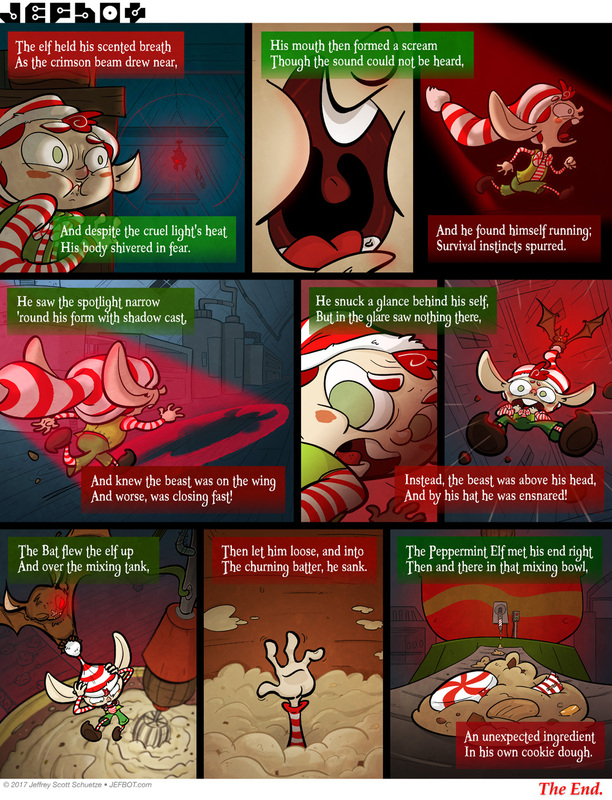 Poor elf. That’s the last time he will do that. Happy New Year! Thank you for all your work. Trust that this year will bring you steady work and enjoyable times. happy new year back atcha, Kris! and thanks for the positive words – i’m trusting in both those things! Holy frick, I did not expect to come here and find an actual comic update. That is a very pleasant surprise. Well, that’s how the cookie crumbles.